Cowboy up.That’s essentially what the town council in Snowmass Village said to a rodeo official Monday, agreeing to forgo charging the rodeo rent this year and next.That will make three years in a row that the town has not charged the Snowmass Western Heritage Association $10,000 for renting the prime real estate at the entrance to town. 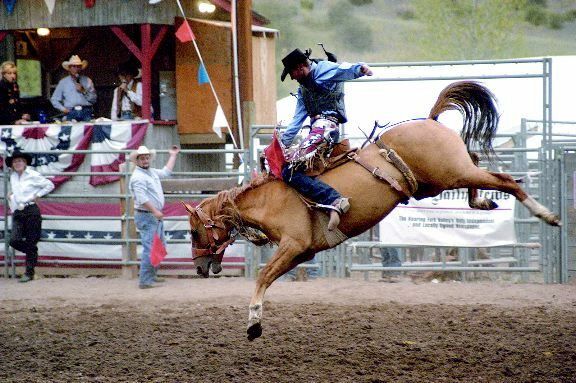 Mayor Doug Mercatoris did say he would like to see the $10,000 “loan” the town gave the association last year paid back.The council’s 4-0 decision came after a presentation on the rodeo’s 2005 finances by the association’s Chris Kelly. Councilman Arnie Mordkin abstained because he receives a small stipend as an announcer at the event.Kelly’s group considers the past year a success, she said, as big crowds came out this summer for the Wednesday rodeos. Two vendors at the site also were pleased with how the summer turned out, Kelly said. As for the finances, “We actually have money left,” she said. Despite a drastic decline in individual business contributions over last year, the rodeo saw a net income of $12,000, compared to $2,000 in 2004. While the rodeo’s net income rose, its total income was down sharply, from $320,500 in 2004 to $213,158 this year.There were several differences in this year’s rodeo, including its once-a-week schedule. Last year, rodeos took place on Wednesdays and Saturdays. Additionally, prize money in 2005 dropped by half, and the age requirement allowing kids to get in free was lowered from 12 to 10 to bring in a bit more cash.Expenses were also down significantly, owing to the above factors. Total expenses in 2005 were $195,563; the year before they were $308,800. “Significant strides” were made to control expenses, Kelly said.Her presentation also covered the results of a survey of people who attended the rodeo, along with crowd numbers. About 40 percent of survey respondents said they came to Snowmass Village while staying in Aspen; 75 percent brought children; and 79 percent were from out of the state or country, including visitors from Japan, the Netherlands and Chile.The rodeo’s highest attendance was on July 27, with 1,100 people; on Aug. 24, 900 attended. According to figures presented to council, some rodeos saw crowds of only 250 and 300 people; the average attendance was about 700, Kelly said.In making her pitch for town support, Kelly noted several benefits that the rodeo brings to the town. There is an untapped resource, Kelly said, in cross-promotional and local sales activities that could be tied into the event. She also gave comparisons to rodeos in Steamboat Springs and Beaver Creek, saying municipalities in those areas offer free rent and maintenance. Steamboat also provides $35,000 annually to support the event, she said. Financial support from Snowmass Village will be used to “enhance the performance,” expand marketing efforts and support children events.The meeting drew about 12 people. All who spoke to the council supported the rodeo, including Lance Burwell of the Silvertree Hotel.While it may not be the most fiscally successful event, it gives the hotel and conference center something different to offer to groups considering a gathering in the town, Burwell said.”We want to make sure the rodeo is offering a quality product,” he said. “It supports a great local activity.”Snowmass Village resident Barry Peters said the rodeo is important to the town and its children, who look forward to it each week. “It distinguishes the town from others,” he said.Burwell and most of the council said a priority is tapping into the business community for contributions and other support, and jump-starting the rodeo’s marketing. Individual business donations totaled $96,500 in 2004, but only $56,800 has been contributed this year.